Welcome to the office of Drs. McBride and Carr. A practice for the treatment of problems of the teeth, jaws and face. the highest quality Oral and Maxillofacial and Cosmetic surgical services in a competent, compassionate and personalized manner offering maximum privacy, comfort and convenience for our patients. Wrinkles are a natural part of aging. As you grow older, your skin gets thinner, drier and less elastic. And it becomes less able to protect itself from damage. As a result, wrinkles, lines and creases form in your skin. Although genetics are the most important determiner of skin texture, a major contributor to wrinkles is spending too much time in the sun. Smoking also can cause premature aging of your skin. If your wrinkles are bothering you, you have more options than ever to help eliminate or at least diminish their appearance. Medications, skin resurfacing techniques, fillers, injectables and surgery top the list of effective wrinkle treatments. Your skin is the largest – and most visible – single organ in your body, providing your tissues, bones and organs with a natural suit of armor. Your skin is also a window to your overall health, as well as the first part of your body to show the noticeable signs of aging and sun damage. Cosmetic surgery deals with the cosmetic conditions of the skin, hair, nails, veins by various surgical, reconstructive, cosmetic and non-surgical methods. The purpose of cosmetic surgery is to repair and/or improve the function and cosmetic appearance of skin tissue. Thanks to research breakthroughs, clinical advances and instrumentation innovations pioneered by skin surgery experts, the majority of cosmetic surgeries is now minimally invasive and requires only local or regional anesthesia. This translates into superior patient safety while reducing the all-important "downtime" and recovery period. In addition, new developments and the latest techniques are constantly enhancing the results of many established skin surgery procedures. Examples of cosmetic surgery procedures include anti-aging treatments, correction of acne scarring, laser surgery, forehead lift, and face lifts. Dr. Carr invites you to go through our site and inform yourself on the different cosmetic options which are available to you here in our office. As always, Dr. Carr is available to address any questions which may arise. Call to schedule your cosmetic surgery consultation with Dr. Carr (831) 636-9808. A number of conditions may require oral surgery, including wisdom teeth, tooth loss,and jaw related problems. 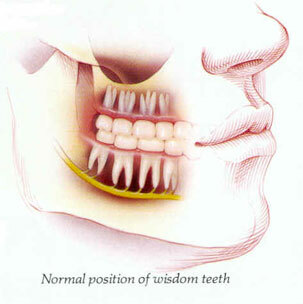 Wisdom teeth, otherwise known as third molars, are the last set of teeth to develop. Sometimes these teeth emerge from the gum line and the jaw is large enough to allow room for them, but most of the time, this is not the case. More often, one or more of these third molars fails to emerge in proper alignment or fails to fully emerge through the gum line and becomes entrapped or "impacted" between the jawbone and the gum tissue. Sometimes it is necessary to place bone in the area of the planned implant sites, more information on bone grafts is found here. Dental implants are an option for tooth loss due to an accident or infection or as an alternative to dentures. Questions and Answers about dental implants is available here. Oral and Maxillofacial surgical procedures. Schedule your dental consultation with Dr. McBride or Dr. Carr by calling (831) 636-9808. Our office building was constructed at the end of 1996. We opened San Benito Oral and Maxillofacial Surgery in 1997. Built to the newest standards and regulations for patient safety. Botox® cosmetic is a prescription medicine that is injected into the muscles and used to improve moderate-to-severe frown lines for a short period of time. Also known as blepharoplasty, eyelid surgery improves the appearance of the upper eyelids, lower eyelids, or both and gives a rejuvenated appearance. For the enlargement of thin lips more and more filling materials, which can be given with simple injections, have been developed in the last several years. Recent advancements in filling materials have been developed to ease the look of facial folds on the face. Some patients have permanent results with 2 - 3 injections. Dr. Brian Carr holds a both a Dental Degree and Medical Degree. He is a member of the the American Association of Oral and Maxillofacial Surgeons (AAOMS) and a diplomate of the American Board of Oral & Maxillofacial Surgery (ABOMS). Dr Carr is an Associate Clinical Professor at UCSF and has taught facial trauma reconstruction at Zuckerberg San Francisco General Hospital for several years. Dr. McBride has been practicing oral and maxillofacial surgery in the Hollister, California area for over twenty years. He is also a Clinical Assistant Professor in the Department of Oral and Maxillofacial Surgery at University of California San Francisco. Our staff is highly trained and qualified to handle all of your needs. We invite you to come in for a consultation. We are here to answer your questions, please give us a call at (831) 636-9808 or please use our contact page. Thanks to research breakthroughs, clinical advances and instrumentation innovations pioneered by skin surgery experts, the majority of cosmetic surgeries is now minimally invasive and requires only local or regional anesthesia. This translates into superior patient safety while reducing the all-important "downtime" and recovery period. In addition, new developments and the latest techniques are constantly enhancing the results of many established skin surgery procedures. In just a short time, you can melt the years away from your face, looking natural and refreshed. Dr. Carr can provide temporary improvements, such botoxto more permanent solution s such as a neck lift,or a face lift. Get the results you choose with minimal interruption to your daily life. Contact us for additional information. Did you know that dental implants are frequently the best treatment option for replacing missing teeth? Rather than resting on the gum line like removable dentures, or using adjacent teeth as anchors like fixed bridgers, dental implants are long term replacements that your oral and maxillofacial surgeon surgically places in the jawbone. Our experienced and professional office staff members are here to help you with all your questions. We are conveniently located in Hollister, California in San Benito County at 890 Sunset Drive, Suite B-1A in Hollister, CA 95023. Our telephone number is (831) 636-9808. For driving instructions, click here. Refer a patient by sending secure referrals, attach X-rays and other documents and communicate securely with our clinic. Bienvenidos a la oficina de Dres. McBride y Carr. Una práctica para el tratamiento de problemas de los dientes, las mandíbulas y encara. LLame a nuestro telephone (831) 636-9808, hablamos español para ayudarle. Copyright © 2016 NetWideSales. All Rights Reserved. NOTICE TO WEB SITE BROWSERS: This website is provided for informational and educational purposes only. No doctor/patient relationship is established by your use of this site. No diagnosis or treatment is being provided. The information contained herein should be used in consultation with an oral and maxillofacial surgeon or other physician of your choice. No guarantees or warranties are made or implied regarding any of the information contained within this website. This website is not intended to offer specific medical, dental or surgical advice to anyone. Drs. McBride and Carr are licensed to practice medicine in the state of California, this website is not intended to solicit patients from other states. Further, this website and Drs. McBride and Carr take no responsibility for websites hyperlinked to this site and such hyperlinking does not imply any relationships or endorsements of the linked sites.